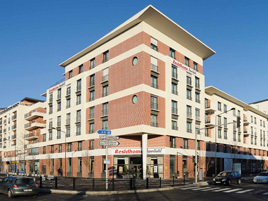 The Paris-Evry extended stay hotel is at heart of Genopole 'genetics valley', across from the University complex. It is located in the town center, close to the train station, a shopping center, and a few kilometers away from Orly airport. With its balanced and bold architecture, the residence blends in harmoniously with its downtown neighborhood. The residence has shops on the ground floor and a private garden, a doorman and a secure environment. Come and explore Evry, France's youngest city, rich in parks and green spaces, large places of worship, university and business hubs, France's genetics capital, and birthplace of the Telethon..